Man...this game felt so, so good. There was a time, when it was tight in the 3rd quarter and the rain the falling and both teams putting the ball on the ground, where you felt like this game could've slipped the other way. Michigan State turned a Michigan fumble and a short field into 7 points to tie it up. But you have to note the resolve of the Michigan players not to panic and to continue to play their game. Much like against Wisconsin a week ago, Michigan stuck to what they do and eventually wore Michigan State out. When Shea Patterson hooked up with Donovan Peoples-Jones for a 79 yard touchdown late in the 3rd quarter to break the game open, you just had a feeling that was the winning score. Michigan State could not move the ball to save their lives...even their one and only score was a gift from the rain gods. The score for much of the game was tight, but the stats told a completely different story. Through the first 3 quarters, Michigan was outgaining MSU 308 to 87, yet the score was only 14-7. Really the key stat of the day was 3rd down conversions. Michigan State was 0 for 12 on 3rd downs. I've never seen that before. Brian Lewerke was 5 of 25 for 66 yards...one of the lowest QB outputs I've ever seen against a Michigan defense. Oddly, this was the first game of the year where Brian Lewerke did not throw a pick. You can blame the weather for the passing game struggles, but Shea Patterson was 14 of 25 for 212 yards and 2 touchdowns. Really the story of the game was defense, which we'll get to more in the next section. Don Brown cooked up a defensive gameplan that completely shut down the Spartan offense. At the end of day, MSU averaged 1.8 yards per play and only ran 51 plays to Michigan's 78. For the first time in a long time, ball control was Michigan's friend when it mattered the most. Up 21-7 with 9:19 left in the game, Michigan put together a 9 play 13 yard (there were a couple of penalties) drive that consumed 6:41 of game clock that really ended any sort of realistic comeback thoughts Michigan State might've had. Michigan held Michigan State to 94 yards of total offense...79 through the air and 15(!) on the ground. 23 carries for FIFTEEN YARDS! Michigan State is not exactly an offensive juggernaut, but to contain your rival to under 100 of total offense on their home turf in a premier game like this...that's truly something. Brian Lewerke, noted for his ability to make plays with his legs, had 4 runs for -11 yards...which basically means he was sacked 4 times...once by Devin Bush and Michael Dwumfour, and twice by Josh Uche. As we head into this bye week and then the final month of the season, there is no question that Michigan's defense IS elite. But they've been elite before. The difference this year is the Michigan offense, notably Shea Patterson and the offensive line. That's the difference between this year and last year. Don Brown has his guys playing at a very high level right now, and that shouldn't be taken for granted. But what the OL is doing is the reason Michigan is 7-1 ranked in the top 5 instead of where we were a year ago, unranked with ugly losses to Michigan State and Penn State. This team just feels different. There's something going on and I could feel it after the game yesterday both on the field and in the post-game presser. That win yesterday was special for this team and the coaches. Call is cockiness, call it swagger, call it an attitude...but this team is feeling it right now. The bye week comes at a good time. Michigan sits atop the Big Ten east with a 5-0 record and everything to play for in front of them. The weather delay was annoying, but it wasn't the worst of the game. I honestly don't think it had a meaningful impact on the game either way. The worst for me was the chippiness of Michigan State. It's just really annoying, and frankly, it's getting old. It's bad for this rivalry, it's bad for football, and unfortunately, it's the way Michigan State has decided they want to play this game...year in and year out. It all stems from Mark Dantonio and his bitterness with Michigan. It's the culture he's created in East Lansing. It's not about playing winning football, it's all about just beating Michigan. I don't know what else to say about it other than it all backfired in their face yesterday when a far better Michigan team decided it wasn't going to put up with it any more. There's a fine line between sticking up for yourself when Michigan State commits obvious unsportsmanlike conduct penalties and going too far and following them down that rabbit hole. Michigan stood their ground and pushed right back. In the 3rd quarter, it seemed that Michigan could've played the kind of game MSU wanted them to play, but when they had finally had their chances, they put Michigan State away. The pregame shenanigans were stupid. But they did set the tone for the game. Whether by design or not, MSU late pregame walk was meant to intimidate Michigan and establish Michigan State as the home team playing in their house. I guess what was odd about it was that it totally backfired. In years past, that would've spelled doom for Michigan teams under Rich Rod or Brady Hoke. But this team is different. Michigan knew they were the better team and no amount of pregame nonsense was going to dissuade that. Devin Bush set the tone by tearing up the Michigan State midfield logo. Call it childish, I don't care, he knew he wasn't going to settle for MSU's head games and he was going to make sure his teammates didn't either. Dude had a day. 33 carries for 144 yards in a game where both teams had to run the ball. Fortunately for Michigan, they were only team that could. Coming into this game, MSU was giving up an average of 62.3 yards on the ground. Michigan had 183. I could've picked anyone for the defensive game ball. Really the entire secondary deserved this as well. So did Devin Bush. So did Josh Uche, Tyree Kinnel and Kwity Paye. But Chase was everywhere...he set up shop in the MSU backfield all day. In a game he certainly had circled on the schedule ever since he decided to come back for his senior year, this was a huge day for Chase and his defensive teammates. Will Hart had a nice day punting. For a while this was a field position game, Michigan had 8 punts to MSU's 11. But Hart showed he has more than just a booming leg. He pinned MSU back inside their 20 three different times. 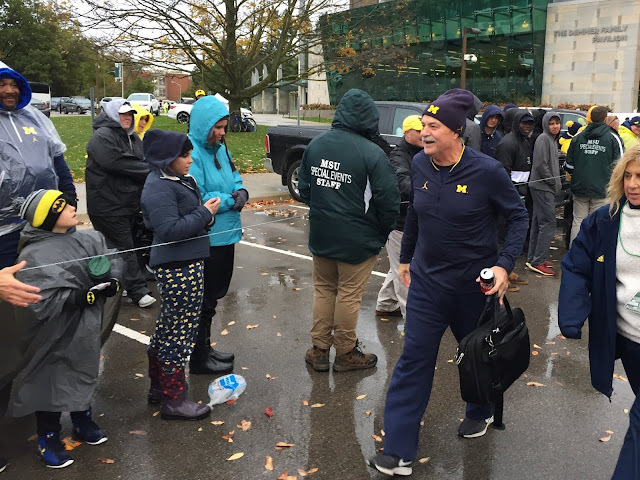 Snapped this pic yesterday of a very happy and smiley Don Brown exiting Spartan Stadium. I think this picture says it all.